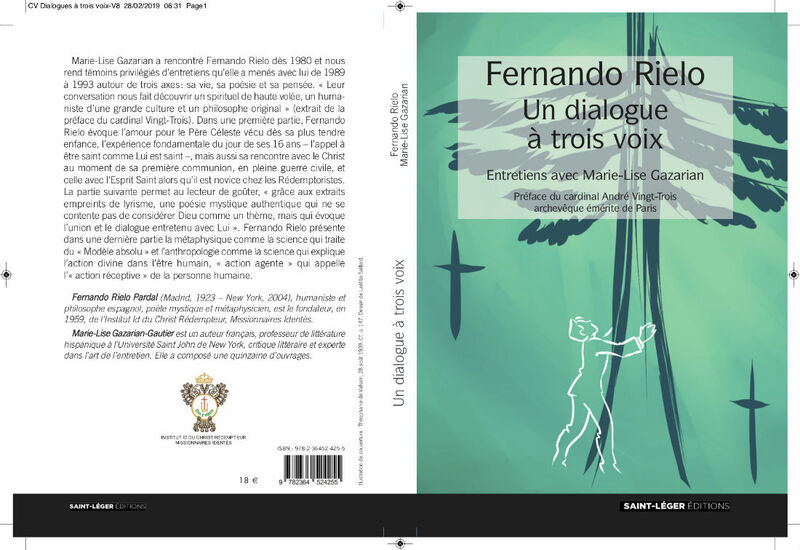 Last March was published the French edition of the work Fernando Rielo: un diálogo a tres voces with the title Fernando Rielo: Un dialogue à trois voix. Entretiens avec Marie-Lise Gazarian. The publishing house is Saint-Léger Editions and the translation has been done by the team of the Idente School of France. The book is prologued by Cardinal André Vingt-Trois, archbishop emeritus of Paris, who states in the book that in Marie-Lise Gazarian’s conversation with Fernando Rielo one discovers “a spirituality of high flight, a humanism of great culture and an original philosopher. Fernando Rielo is all that at once, besides being the founder, in 1959, of the Id Institute”. The Cardinal’s words reflect not only an understanding of the breadth of Fernando Rielo’s figure but also of the scope of his life and thought. In this sense, he affirms that although Rielo is heir to the great mystics of the Spanish Golden Age, of the language of Cervantes or of the passion of the Spanish poets and thinkers of the 20th Century, “the richness of this deeply Catholic personality defies all classification and could no longer remain inaccessible to the French-speaking reader”. After inviting the reader to savor his mystical poetry and to discover his deep metaphysical thought, Cardinal Vingt-Trois ends his gloss by underlining the essence of Fernando Rielo’s charism: “We can only hope that this “three-voice dialogue” will be for the reader an invitation to maintain an ever more intimate relationship with the divine Persons and to follow the call to holiness received from the Father by the young Fernando on his 16th birthday, a call that would resonate universally in the heart of the Second Vatican Council a few years later”.